Different Kinds of Trucking Company Negligence | DeLoach, Hofstra & Cavonis, P.A. Many truck accident victims assume the operator is the person who should be named in their injury lawsuit. After all, if the truck driver’s error resulted in an accident, he's obviously the one at fault. What victims may not realize is that the trucker’s employer, the commercial trucking company, can also be held liable in the majority of truck accident cases. All U.S. trucking companies are regulated by the Federal Motor Carrier Safety Administration (FMCSA), which issues mandatory directives that all carriers are required to follow. If a driver breaks any of these laws, the carrier can be held responsible for the costs of any injuries, and may also be ordered to pay steep fines for breaking the law. Nearly all types of truck accidents involve some degree of driver error. Whether it's simply braking too late or spending too many hours behind the wheel, a trucker’s mistake can have long-lasting consequences. Conduct background checks on drivers before hiring. Trucking industry employers are required to perform pre-employment background checks to see if drivers have committed any traffic violations, criminal offenses, or other infractions. Ensure that drivers are qualified. All truckers are required to hold a valid commercial driving license (CDL), and the employer must ensure each driver’s license is valid. In addition, the driver cannot operate a truck at any point when his license is suspended or canceled. Finally, employers must ensure their drivers have completed all necessary specialized training required to operate a tractor-trailer. Conduct regular random drug tests on drivers. Trucking companies are required to perform drug and alcohol screenings without giving truckers advance warning of the tests. Ensure that all cargo is properly loaded. Numerous accidents occur each year because cargo isn't properly secured in/on the trailer. In most cases, workers from a third-party loading company are employed to load and unload this cargo. It's ultimately the trucking company’s responsibility to ensure that cargo is properly loaded, balanced, and secured inside the trailer or on a flatbed for the duration of the journey, regardless of which party loaded the trailer. Enforce compliance with hours-of-service requirements. The FMCSA has established strict rules that limit the length of time a trucker may spend behind the wheel. Trucking companies are required to monitor their drivers to ensure that they're not breaking these rules, and have a duty to discipline drivers who violate safety regulations. In addition to sharing liability for accidents caused by truck driver error, trucking companies can also be held responsible for problems with their vehicles. The carrier is responsible for maintaining its fleet, and a failure to discover and correct any defects in trailers or rigs may be considered negligence. Meet minimum safety standards. Semi trucks are required to adhere to certain safety requirements, such as underride protection, fire extinguishers, flares, and other implemented regulations. Be inspected regularly. 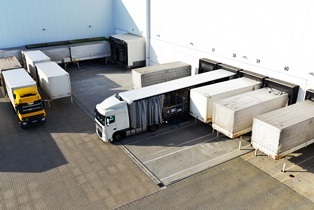 Commercial carriers are required to perform routine inspections on their vehicles, and drivers must complete a safety inspection before each trip. All equipment must be monitored for defects, such as broken mirrors and cargo locks, or chipped reflective paint, and must be replaced as soon as there are noticeable signs of wear. Undergo proper maintenance. Commercial vehicles should undergo regular maintenance, including oil changes, light bulb and windshield wiper replacement, inspecting brake lines, and replacing worn brake pads and tires. If a defect is identified during an inspection, it should be repaired along with any other regular maintenance that's due. Receive adequate repairs. Any worn or damaged truck parts should be replaced as soon as possible using items that are appropriate for the particular make and model of the vehicle. If you were injured in a truck crash, experts at our firm can determine who is at fault for your medical bills, lost wages, permanent disability, and pain and suffering. Simply fill out the quick contact form on this page to set up your consultation with a truck crash attorney. We provide help to injury clients on a contingency-fee basis, so we don't collect any fees until your case is won.